The year is 2242, and you are Paladin, the toughest bounty hunter in the galaxy. 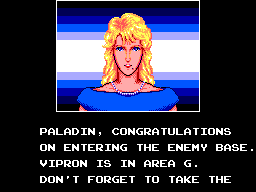 You have been hired to assassinate the cyborg leader Vipron.Sounds easy doesn't it? Well it would be if it were just Vipron, but you must first infiltrate the cyborg fortress then battle though an entire army of cyborgs in seven different areas and face Vipron's Many henchmen before the final confrontation. Don't worry though, your not alone, you have Adina to help guide you. And as you delve deeper into the Cyborg fortress your weapons arsenal will grow. I was amazed when I first got this game, its beautifully laid out, you begin at the doorway of the Cyborg fortress, the first task is to go into area one and retrieve a shield needed to breach the electron barrier preventing access to area two. The game follows this pattern throughout, each level or zone will give you different items which are useful in the next. For instance there is one level which is completely dark, and the level before this you can acquire the "Light gun" - a gun that illuminates the entire surroundings of the level. Although it is possible access each level without completing the previous one it is always allot more difficult. One thing that I found really impressive in this game was the use of the 3D radar system, it warns you when your enemies are approaching, different kinds of enemies are represented by different colors. 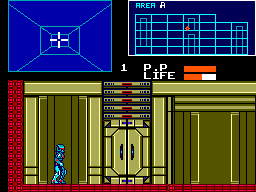 Each level also has multiple floors, which are only accessible by using "turbo lifts". Another great feature is that you can always see your position in the level by looking at the level map. The weapons in the game are good, but not great unfortunately, I remember at first when I got this game I didn't realize you needed to have two control pads plugged in at once to change weapon, for hours I was trying to complete levels by punching enemies. Fortunately you start out with basic punch, and Psycho punch- kind of like an energy punch, you have a Psycho meter which drains away as you use Psycho weapons, you can find more Psycho energy on various levels. Some other weapons are the "Ray gun" - you will find you use this allot. The "Light gun" - just like the ray gun but illuminates the area surrounding it. The "Psycho gun" - the most powerful gun in the game, this is what you need to take on Vipron! There are also other cool items such as the Electron shield, the Hoverboard and some very powerful bombs. So in short, the gameplay is amazingly diverse, there's so much to explore and find, its great fun! The graphics although good are quite repetitive, there isn't a great deal of variety in layouts of each individual levels. Although each area looks different the whole of the level looks pretty much the same. 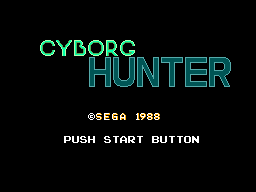 The characters are quite well drawn though, but some of the enemies are a bit silly given the game name "Cyborg hunter" - have a look yourself and you will see what I mean. The music is good, what little there is of it, again, its unique to each area, The first level music is trying to build tension in the game, it doesn't really work that well though. I especially like the music for level 3 and the music for the end of area guardians. The sounds is quite good, all of the weapons have good sound, some of them could have been a bit cooler(the ray gun) but the Psycho gun sounds awesome. The controls are OK for this game, despite the big problem of having to use two control pads during the game. Another problem I found with them is that when you have bomb, and try to get in the elevator if your not standing right in front of it you will accidentally detonate the bomb. The long term replay value of this game is pretty good - I have played this game though about six times so far, each time I really enjoyed it. The game just has an appeal that I cant put into words. This is an awesome game, worthy of a place in any SMS game collectors library, I did notice some similarities to the Zillion series, I have to wonder if they were made by the same authors. The game can take a while to get into, but once it started I was hooked, I'm sure you will be too - give it a try!